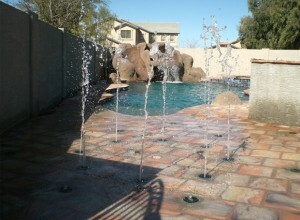 See a Residential Splash Pad Installation Here! Thinking of installing a splash pad on your own? RainDeck's Installation Video shows you an overview of a complete residential splash pad installation from start to finish. 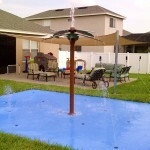 Residential splash pads / splash parks are great for ANY backyard! From smaller backyards with limited space to large, luxurious backyards, our Residential splash pad products are safe, fun, and affordable. Rain Deck’s Patented Splash Pad Kits℗ can be installed by any contractor, handy-man, landscaper or do-it-yourselfer. Rain Deck is the pioneer of the Residential Splash Pad / Splash Park. Having a personal splash pad in your own backyard was not a reality until Rain Deck burst on to the scene to provide a residential splash pad / splash park product line. Our goal was to innovate residential splash pad products that would be as reliable as our commercial and light-commercial splash pad products but with a price point that would rival the installation of a traditional swimming pool. Rain Deck’s success is unmatched throughout the industry in providing the best residential splash pad products. With a patented Rain Deck Splash Pad Kit℗ you can have any splash pad installer quickly enhance your backyard entertainment experience that will make you the envy of all the neighbors! 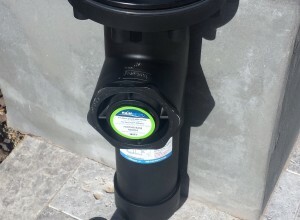 Rain Deck provides splash pad kits that are configured to have either 6, 8, 12 or 16 nozzles. 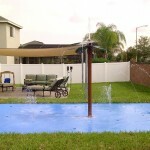 You can choose to have a stand-alone splash pad or one that is tied into your pool. Contact one of our Sales Representatives to learn more about the only patented Splash Pad Kit℗ available in the industry. Just like Rain Deck’s commercial and light-commercial splash pad products the residential splash pad above ground water features are interchangeable with the Rain Deck Footing Base. This unique option can change your backyard into a mushroom forest or into a palm tree oasis in just a short time. With a wide range of interchangeable nozzles you can shape your splash pad into a shower of fun or into a directed wave of excitement with the quick turn of any of our nozzles with the Rain Deck Nozzle Tool. Safety is a driving force behind the popularity of splash pads / splash parks. With little to no standing water a splash pad is an affordable and safer alternative to a traditional swimming pool. 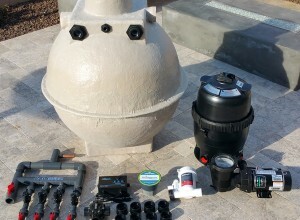 Our highly knowledgeable team is available to discuss your residential splash pad needs today! Fill out the form or give us a call to see how we can help you put together your dream splash pad for your residential site! 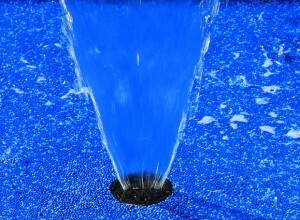 Below are the latest blog posts and news items about our residential splash pad products.